It’s about that time again…. I know I say it every year, but I really can’t believe we’ve reached December and are on the verge of entering a new year. I wouldn’t exactly say 2017 flew by, but it is rather ethereal that it’s almost over and that we’re so close to starting 2018. Show of hands, how many of y’all have your Christmas trees up? If you’ve been following the blog for at least a year, then you already know what the month of December will bring ’round these parts. If you’re new here, then welcome. This post will kick off a little series I’ve been doing annually from CIMs very first Christmas called the 12 Days of Christmas. For 12 days I share Christmas-themed baking recipes that I think would fit in rather nicely on a holiday spread of goodies that you make for yourself or others. Baking twelve days worth of treats is no small task, but guys, I’m still so excited to get this series going. The 12 Days of Christmas is my absolute FAVORITE time of year to be a food blogger. There are so many delicious looking posts/recipes that I get to see fill my timeline and also contribute myself. I try to plan ahead and put out a variety of posts that can be tried out by both amateur and advanced bakers. Sometimes all goes accordingly to the plans–other times…most times, I have to adjust/tweak a bit. Regardless, I always end up having fun, which is what really matters. I first made my own pop tarts about two years ago. I wasn’t sure how it would go–or if it would go at all. But the 12 Days of Christmas seemed like a good time to test it out. I found that it’s actually a pretty easy process and that both the dough and filling go VERY well with just about whatever you want to do with them. 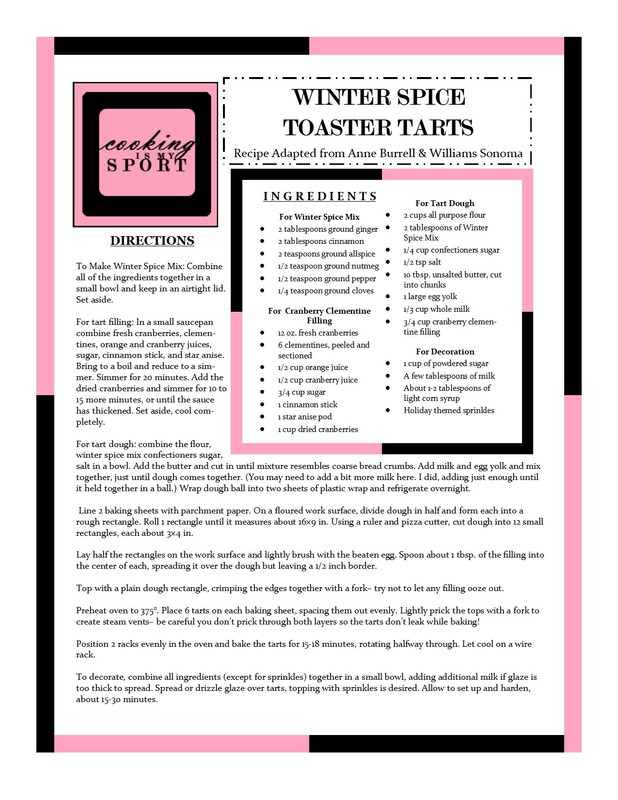 Today’s recipe revisits my first go at toaster tarts, but then tweaks it a bit with the addition of some new ingredients. Those new ingredients are a Winter Spice mix that has classic holiday baking flavors: ginger, cinnamon, allspice, nutmeg, and cloves. There’s also some pepper (yes, pepper) just to give it an extra kick. I added about two generous tablespoons of this spice mix to the base of my buttery toaster tart dough. It doesn’t alter the chemistry of the recipe, but it sure does give a whole new depth of flavor to dough itself. The filling I did keep the same just because I love it SO much, but I realize not everyone is a cranberry-clementine fan, or you just may not have the time to make it from scratch. As I said, you really can do anything you want with the filling within reason. Any jam, jelly or preserves you want to use would work. If you’re a fan of apple butter or pumpkin butter, it’ll work. Heck, if you want to use biscoff spread, cookie butter, or Nutella: IT’LL WORK. But come on: doesn’t that cranberry-clementine filling look delicious? Don’t you want to at least try it? I thought so. Sharing this recipe at today’s Fiesta Friday #200. Stay tuned for more recipes for the 12 Days of Christmas! To Make Winter Spice Mix: Combine all of the ingredients together in a small bowl and keep in an airtight lid. Set aside. For tart filling: In a small saucepan combine fresh cranberries, clementines, orange and cranberry juices, sugar, cinnamon stick, and star anise. Bring to a boil and reduce to a simmer. Simmer for 20 minutes. Add the dried cranberries and simmer for 10 to 15 more minutes, or until the sauce has thickened. Set aside, cool completely. For tart dough: combine the flour, winter spice mix confectioners sugar, salt in a bowl. Add the butter and cut in until mixture resembles coarse bread crumbs. Add milk and egg yolk and mix together, just until dough comes together. (You may need to add a bit more milk here. I did, adding just enough until it held together in a ball.) Wrap dough ball into two sheets of plastic wrap and refrigerate overnight. Line 2 baking sheets with parchment paper. On a floured work surface, divide dough in half and form each into a rough rectangle. Roll 1 rectangle until it measures about 16×9 in. Using a ruler and pizza cutter, cut dough into 12 small rectangles, each about 3×4 in. Lay half the rectangles on the work surface and lightly brush with the beaten egg. Spoon about 1 tbsp. of the filling into the center of each, spreading it over the dough but leaving a 1/2 inch border. Top with a plain dough rectangle, crimping the edges together with a fork– try not to let any filling ooze out. Preheat oven to 375°. Place 6 tarts on each baking sheet, spacing them out evenly. Lightly prick the tops with a fork to create steam vents– be careful you don’t prick through both layers so the tarts don’t leak while baking! Position 2 racks evenly in the oven and bake the tarts for 15-18 minutes, rotating halfway through. Let cool on a wire rack. To decorate, combine all ingredients (except for sprinkles) together in a small bowl, adding additional milk if glaze is too thick to spread. Spread or drizzle glaze over tarts, topping with sprinkles is desired. Allow to set up and harden, about 15-3o minutes. I’ve bought so many pop tarts when my kids were little and ate my share. Your homemade tarts look so much better and would be perfect for Christmas morning. 12 days of is sure ambitious and I love seeing what you come up with. I can’t wait for 12 Days of Christmas! I love these! It’s amazing how a home-made one blows away anything else, and this recipe is perfect for the Holidays! I’m going to have to make these for the grandkids when I visit! Well thanks! 🙂 Five now, but two are twins. That was a surprise! You made them????? Wow! Amazing! These are brilliant! Can’t wait to make them! These tarts look so festive and tasty! Fantastic. Is the filling hotter then the surface of the sun like a bought pop tart? You had me at “winter spice”. Those toaster tarts look amazing! And that cranberry clementine filling – I think I could eat a whole bowl of that. Oh trust me, I can eat the filling all by itself with a spoon lol Thank you Lily!